A premiere at the Russian Cultural Days: two theater plays, live at Lipscani Theater, with Romanian translation, followed by masterclasses with the Russian artists held at the Russian Center for Culture and Science. The audience enjoyed: “Few Days of Mrs. Liuba’s Life” and “Pages from Esenin’s Burnt Notebook”. 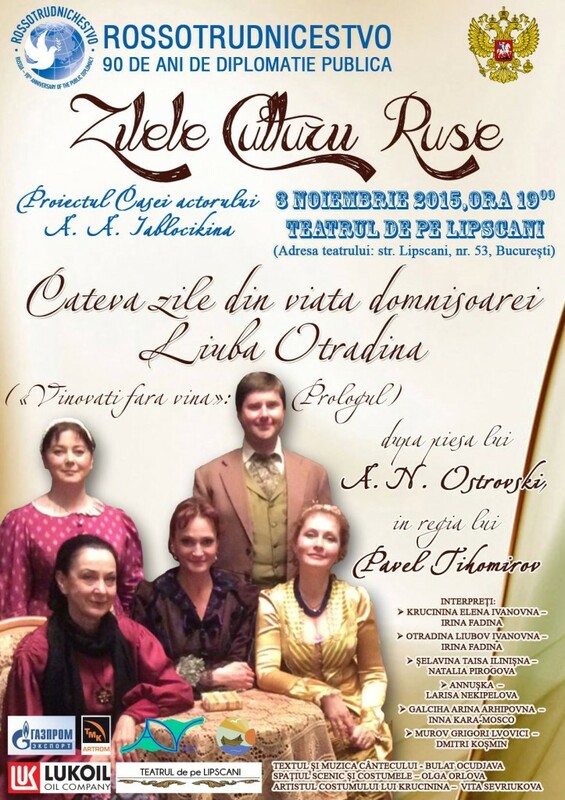 The event was organized by the Rossotrudnicestvo Representation in partnership with Artviva and Lipscani Theater. This entry was posted in Film TEEP 2014, Film TEEP 2015. Bookmark the permalink. The fourth DVD series of Mosfilm GOLD Films is launched! Copyright © 2019 Artviva - CO-PRODUCTION TRAINING GROUND.